These guys, sculpted by Alan and Michael Perry have been around forever and still look great today despite being a little on the small side compared to the heroic scale 28mm figures that now predominate the hobby. 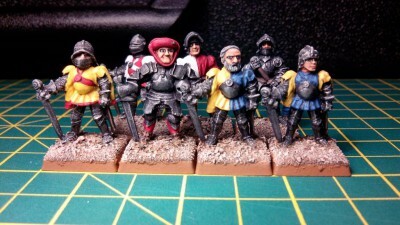 Originally released by Citadel Miniatures in 1984 they now form part of Wargames Foundry’s Men at Arms range. The chap wearing the red chaperon in the front row puts me in mind of a UK children’s presenter. Anyone else with small children regularly subjected to the CBeebies channel recognise Justin Fletcher aka Mr. Tumble? This entry was posted in Pre-1985 and tagged Alan Perry, Citadel, Men at Arms, Michael Perry, Wargames Foundry on November 14, 2014 by Hobgoblin Orange.